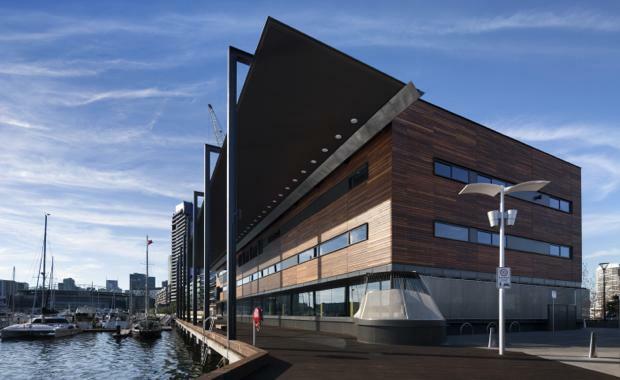 Australia’s most sustainable public building, Library at The Dock, claimed the Development of the Year award at the annual Property Council of Australia Victorian awards evening on 18 May. A finalist in three categories – innovation, best public building and best new sustainable development, the library took out the prestigious “Development of the Year” award among strong competition. Delivered through a tri-partnership between the City of Melbourne, Places Victoria and Lendlease and designed by architects Clare Design with Hayball as architect of record, Library at The Dock will now be in the running for the national award, due to be announced in Sydney next month. Chair of the City of Melbourne’s Environment Portfolio, Cr Arron Wood said along with its green design the building offers an extensive traditional library collection, music and sound recording facilities, digital gaming, and a performance space that holds 120 people. “The library pays homage to Docklands’ rich maritime heritage with reclaimed hardwood from the waterfront used throughout the building. It is located in a spectacular setting on the waterfront in Victoria Harbour and is anchored by a new park and children’s play space,” Cr Wood said. 2015 Property Council National Awards[/caption]Lendlease’s Managing Director of Urban Regeneration Jonathan Emery said he was thrilled that the Library continues to be recognised. “Library at The Dock provides a place for culture, community interaction and learning and represents world leadership in sustainable design, but beyond that, it’s been critical in fostering a rich and diverse community in Victoria Harbour. Places Victoria’s General Manager Precincts Simon Wilson said the Victorian Government’s development agency was proud to be involved in a partnership that had delivered such an exemplary piece of community infrastructure. “The first decade of Docklands was about buildings. The focus has now shifted to delivering facilities that are the building blocks of a thriving community,” Mr Wilson said. Following its opening in mid-2014, the library has seen more than 123,000 people through its doors in its first year, and over 15,000 people attending library events. The library is only the second building in Australia to be constructed from Cross Laminated Timber (CLT), and the first public building to be constructed from the material. It is also the first public building in Australia to have achieved a six star green star as-built rating from the Green Building Council of Australia’s public buildings rating tool. More than 1.6 million books were borrowed before the building's first birthday. The Property Council of Australia/Rider Levett Bucknall Innovation & Excellence National Awards Gala Dinner will take place on Friday 3 June 2016.